The first thing you’ll need to set up in Draenor will be a garrison. This will provide you materials or help you level, according to the structures you will choose to build. The garrison plots will expand and develop over time as you upgrade your Garrison to higher levels. Wowhead has developed a Garrison Calculator to help you plan out ahead. Level 1- You get the level one garrison by doing the initial questing. two plots will be available: 1 small and 1 large. Level 2- Two small, one medium, one large, Herb Garden Level 1,Fishing Shack Level 1, Lunarfall Excavation Level 1 unlocked. You can upgrade your Garrison to Level 2 at 92 for 200. This automatically teaches you all of the Level 1 blueprints–small, medium, and large. Be aware that Lunarfall Excavation requires level 92 nad the quest Things Are Not Goren Our Way , the Fishing Shack level 94 and Garrison Blueprint: Fishing Shack + Fish Fight and the Herb Garden needs level 96 and the quest Clearing the Garden. Level 3- Three small, two medium, two large. You can upgrade your Garrison to level 3 at 100 for 2000 garrison resources and 5,000 gold. Buildings offer you various benefits, such as additional professional reagents or resources to build your Garrison. There are three building sizes–small, medium, and large. Small buildings focus on professions, while medium and large buildings have cooler perks and collectible items. You will have to pick and choose buildings carefully as there are more building options than there are available plots. Level 1 buildings are automatically learned when you upgrade your Garrison to Level 2–except the Salvage Yard, that requires a short quest at 96. When you complete an Outpost questline, you get a token allowing you to get a Level 2 Garrison blueprint for free. Level 2 small building blueprints require level 96 or completion of Talador. They cost 750. Level 2 medium building blueprints require level 98 or completion of Spires of Arak. They cost 1,000. Level 2 large building blueprints require level 100 or completion of Nagrand. They cost 1,500. Your Level 3 blueprints are unlocked by completing time-consuming achievements. When you construct a building, that costs additional gold and resources. This is where you can build your profession related buildings + banks and salvage facility. The Alchemy Lab creates a variety of reagents and interesting Alchemical wonders. Level 1: Allows the production of Alchemy items and work orders. 7 total work orders. Level 2: Allows followers with the Alchemy trait to work here, granting a unique bonus (stack of potions every day). 14 total work orders. Level 3: 21 total work orders. The Scribe’s Office produces all manners of magical inks, pigments, and paper, and can also create Glyphs and other magical items. Level 1: Allows the production of Inscription items. 7 Work Orders. Level 2: Allows followers with the Inscription trait to work here, granting a unique bonus (create forged goods to get gold from vendors). 14 Work Orders. The Enchanter’s Study creates both the magical precursors that form an enchantment, as well as completed and usable item enchantments. Level 1: Allows the production of Enchanting items and allows non-Enchanters to disenchant items. 7 Work Orders. Level 2: Allows followers with the Enchanting trait to work here, granting a unique bonus (ability to transmog weapon glow). 14 Work Orders. Generates a batch of Tailoring components daily, and allows production of tailored items. Generates a batch of Jewelcrafting components daily, and allows production of Jewelry. Level 2: Allows followers with the Jewelcrafting trait to work here, granting a unique bonus (receive a quest to craft an item for lots of gold). 14 Work Orders. Level 3: 21 Work Orders. Level 1: Allows the production of Blacksmithing items and work orders. 7 Work Orders. Level 2: Allows followers with the Blacksmithing trait to work here, granting a unique bonus. 14 Work Orders. Produces very useful gizmos and parts and also creates great mechanical devices. Level 1: Allows the production of Engineering items. Level 2: Allows followers with the Engineering trait to work here, granting a unique bonus. Also allows up to 3 work orders at one time. The Salvage Yard turns other people’s trash into your treasure. The Storehouse has room to keep your and the garrison’s items safe and secure. Enables access to your personal bank and increases the total number of active work orders for all buildings by 5. Enables access to your guild bank. Enables access to an Ethereal Trader for Void Storage and Transmogrification and increases the total number of active work orders for all buildings by 15. This is where you can create, according to your needs, an Inn, trading post, barn, lumber mill, or if you’re the PvP type a Gladiator’s Sanctum. Great for leveling, you can pick up quests, recruit followers and go on treasure hunting missions. Level 1: Each day, a visitor offering a dungeon quest will spend the day at your inn. Level 2: Recruits random followers each week. You can specify traits and abilities you’re especially interested in. Level 3: Unlocks the particularly lucrative treasure hunter missions. The Trading Post is the Garrison’s center of commerce with the natives of Draenor. It is also an auction house, and a good source for rep gains. Level 1: Allows the trade of crafting reagents for garrison resources and vice versa, for a profit! Level 2: Enables access to the auction house. Also grants access to the Shattari Defense or Laughing Skull factions. Level 3: Increases reputation gain in Draenor by 20% (account-wide). The Barn houses captured creatures that provide the Garrison with leather, meat, and fur. Level 1: Allows you to capture Clefthoof, Elekk, Wolves, and Talbuk for leather and fur. Used for leatherworking and tailoring recipes. Level 2: Allows you to capture Boars and Riverbeasts for rare meats used to create the most powerful food. Level 3: Allows you to capture elite beasts to harvest for savage blood, used in all epic crafted armor and weapons. The Lumber Mill enables access to lumber nodes throughout Draenor. Level 1: Allows you to mark small trees in Draenor for harvest. Harvested Timber can be converted to work orders for Garrison supplies. Level 2: Allows you to harvest medium trees for additional timber. Level 3: Allows you to mark large trees for even more timber. Level 1: Increases your out-of-combat regeneration in outdoor Draenor zones and allows the collection of broken bones from defeated enemy players (used for Conqueror’s Tribute). Level 2: Enables safe fall in outdoor Draenor zones. Also enables the Nemesis quest series for defeating enemy players of specific races. Level 3: While below 35% life, all damage taken is reduced by 50% in outdoor Draenor zones. Grants access to the Highmaul Coliseum gladiator tournament. Usually for defense purposes but can also serve for mount perks, instant travel or even great inventions. The Armory stores and maintains the armaments used by the Garrison’s inhabitants. Level 1:Doubles the chance for your quest rewards to get a rare or epic Bonus Upgrade, and increases the potency of the upgrade. Allows the collection of armor scraps from the orc clans of Draenor for armor transmogrification use. Level 2: Opens up work orders for follower weapons and armor in exchange for garrison resources. Also, new armor transmogrification items unlock. Level 3: Grants 1 of your 3 seals of tempered fate (raid bonus loot roll) at no cost each week. The Barracks houses your garrison’s military forces and followers. Level 1:Grants the Call to Arms ability and unlocks Patrol Missions. Patrol Missions have higher than normal follower experience rewards. Level 2:Allows a follower with the bodyguard trait to accompany you as a guardian in Draenor Zones. Level 3: Increases your follower limit by 5. Enables instant travel to strategic points in Draenor! Level 1: Allows the collection of ogre waystones from Ogres on Draenor. These waystones can be used to power an Ogre Waygate of your choice on Draenor. Also occasionaly triggers Runes of Power during combat. Level 2: Unlocks access to a second Ogre Waygate. Level 3: Unlocks access to a third Ogre Waygate. Stables provide significant benefits to your mounts. Level 1:Enables the capture and training of special mounts on Draenor. Level 2:You may remain mounted while interacting with objects in outdoor Draenor zones. Level 3:Increases mount speed in Draenor by 20%. Crush your enemies with your mechanized might! Level 1: Unlocks a personal engineer that creates a powerful invention each day. Exceptional work! Level 2: Your engineer gains access to five new and amazing devices. Level 3: Allows the creation of a siege vehicle once per day. Drive it to victory in Draenor! The Fishing Shack provides bait, tackle, and support to those looking for their next big catch. Level 1: Allows small Draenor fish to be caught in garrison waters and provides access to daily Fishing quests. Level 2: Allows medium Draenor fish to be caught in garrison waters. Level 3: Allows enormous Draenor fish to be caught in Garrison waters. Also grants you a chance to catch a unique fish that can be used to lure mysterious creatures onto the shore. A bountiful garden for the planting and harvesting of Draenor herbs. Level 1: Grows Draenic Seeds into herbs each day and herbalism nodes are available in the garden. 7 Work Orders. Level 2: Allows followers with the Herbalism trait to work here, granting a unique bonus (can select herbs you want to grow). Also increases the amount of herbs that can be harvested at the garden. 14 Work Orders. Level 3: Grow a unique Draenor fruit tree in your garden that grants food buffs. 21 Work Orders. Level 3: A final mineshaft allows access to rich mining nodes. In addition, garrison guards will patrol your mine, keeping it clear of hostile Goren. 21 Work Orders. The Menagerie provides new opportunities to develop and enhance your pet retinue. Level 1: Attracts elite pets you can battle for rewards. Also lets 5 of your battle pets hang out in your garrison. Level 2: Increases your trap chance and reduces the cooldown of Revive Battle Pets while in Draenor. Up to 10 of your pets can now hang out in your garrison. Level 3: Unlocks a pet battle daily with unique pet rewards. Binding Heal is now only available to Holy Priests. Evangelism is now available only to Discipline Priests. 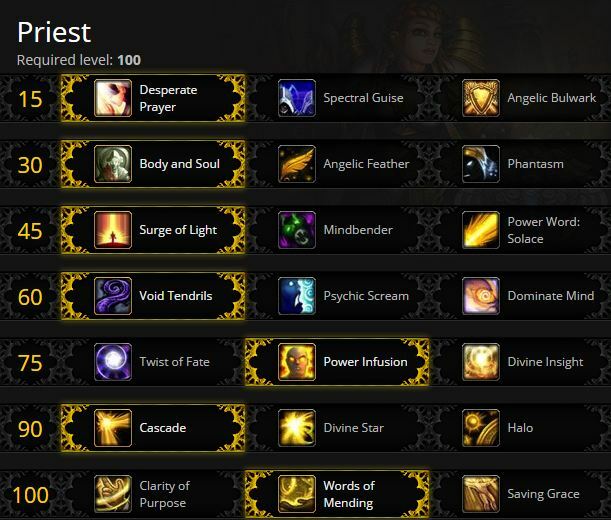 Spirit Shell is now a level-75 talent, replacing Divine Insight for Discipline Priests. Greater Heal has been renamed to Heal. Borrowed Time‘s effects have been merged into baseline Power Word: Shield for Discipline Priests. Borrowed Time has been redesigned. It now increases the Priest’s stat gains to Haste from all sources by 40% for 6 seconds. Devouring Plague now always costs 3 Shadow Orbs, and how heals the Priest for 100% of all damage it deals, instead of healing per tick. Holy Fire now lasts 9 seconds (up from 7 seconds). Shadowform no longer allows any healing spells to be cast but also no longer has a restriction on casting other Holy spells. Vampiric Embrace now heals all party and raid members for 10% of damage done, and this healing is no longer split between targets (up from 75% of damage done, split between targets). Lightwell‘s healing effect is no longer canceled if the target takes enough damage. Pain Suppression no longer reduces the target’s threat by 5%. Power Word: Solace now restores 2% mana (up from 1%). Dispersion and Vampiric Touch no longer restores mana. Base mana regeneration rate for Shadow Priest has been increased by 200%, Shadow Word: Pain and Vampiric Touch mana costs have been reduced by 50% to compensate. Evangelism no longer affects the damage or mana cost of spells. Damage of affected spells have been adjusted to compensate. Shadow Word: Pain‘s initial damage is now considered direct damage, not periodic damage. Divine Hymn now heals all party or raid members instead of a variable number depending on raid size. Its healing has been adjusted to compensate. Focused Will now triggers from any damage taken instead of being limited to being the victim of any damage above 5% of total health or being critically hit by non-periodic attacks. Cascade Mana cost has been reduced by 67%. Divine Star Mana cost has been reduced by 67%, and now follows standard AoE capping rules. Halo’s Mana cost has been reduced by 67%, and now follows standard AoE capping rules. Divine Providence is a new passive ability for Holy Priests. Cascade no longer refreshes the duration of Renew for Chakra: Serenity. Circle of Healing‘s cooldown is now 12 seconds (up from 10 seconds). Chakra: Chastise no longer grants a chance for Smite to reset Holy Word: Chastise‘s cooldown. Chakra: Sanctuary no longer increases healing of area-of-effect spells. It now causes healing spell casts to reduce the remaining cooldown on Circle of Healing by 1 second instead of always reducing the cooldown by 2 seconds. Chakra: Serenity no longer increases healing of single-target spells. Power Word: Shield may now critically strike or Multistrike. Divine Aegis no longer grants Power Word: Shield a chance to critically strike. Power Word: Shield now has a chance for a critical effect based on critical strike chance and can Multistrike based on Multistrike chance for all specializations. Shadow Priest‘s Mastery (Shadowy Recall) has been replaced with a new Mastery: Mental Anguish. Devouring Plague now always costs 3 Shadow Orbs. The cooldown of Mind Blast has also been adjusted to make Haste more valuable for Shadow, and removes Haste breakpoints. Mind Blast‘s cooldown is now reduced by haste, but its base cooldown is now 9 seconds (up from 8 seconds). Divine Insight‘s effects have been split based on specialization. From Darkness, Comes Light has been split into two abilities depending on the Priest‘s specialization. Surge of Darkness (Shadow) now has a maximum of 3 charges (up from 2) and can now also trigger its effect from Devouring Plague, but its chance to trigger has been reduced to 10% (down from 20%) to compensate. Surge of Light (Discipline, Holy) activation chance has been reduced to 8% (down from 15%). Power Infusion now grants 25% Haste (up from 20%), but no longer increases damage (down from 5%). Solace and Insanity has been split into Power Word: Solace for Discipline and Holy, and Insanity for Shadow. Twist of Fate now only triggers from healing for Discipline and Holy Priests, and only triggers from damage for Shadow Priests. Angelic Feathers now increases movement speed by 60% (down from 80%). If cast on players, will always prefer the casting Priest over others, then pick the player closest to the targeted location. If there are no players where it is targeted, it will still create a feather that can be picked up, as before. Additionally, when collecting multiple feathers, the duration will be extended instead of replaced; up to a maximum of 130% of base duration. Enlightenment is a new passive ability for Discipline Priests. Holy Nova is no longer available through a Major Glyph, and is instead a Discipline specialization spell. Its mana cost has been lowered and its healing increased. It is intended as the efficient area-of-effect (AoE) healing spell for Discipline Priests. Mindbender now restores 0.75% mana per hit (down from 1.75% mana). Void Tendrils now have 10% of the Priest‘s health (down from 20%), and damage dealt to the rooted target is now also dealt to the Void Tendril itself.